Elias Breeskin was a Russian (Ukrainian) violinist, composer, arranger, teacher, and conductor born in 1896 – the exact date is unknown. One source gives his year of birth as 1897, but that source (Cozio) is usually messy and unreliable. He was a notorious gambler and con man who was a very successful musician in spite of his addiction to gambling. He began violin lessons very early in life and, according to one source, by age 7 was studying formally at a conservatory in Poland. He played in public at age 8 and was acclaimed. It has been said that he studied with Leopold Auer in Russia. Whether that is true is quite debatable. At age 10 (1906), he played for Franz Joseph, the Austrian Emperor. After this performance, the Emperor supposedly gave him a priceless ring right off his finger. That, too, is highly questionable. Soon after, the family came to the U.S. and settled in Washington D.C., a very odd place for a European musical family to settle – then and even now. Sponsored by a Washington benefactor, he may have first gone to Baltimore to study at the Peabody Conservatory. However, Breeskin himself stated that after securing financing from (among a few others) Frank Damrosch (brother of conductor Walter Damrosch and, at the time, Director of the Institute of Musical Arts which later became Juilliard), he began his American musical education at Juilliard (New York) in the spring of 1908. He studied with Franz Kneisel for about seven years. 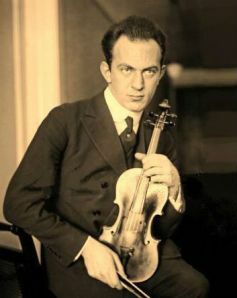 A magazine from that era (The Violinist) and the New York Times reported that Breeskin attended Columbia University after hours, studying languages and other subjects. Possibly upon graduation from Juilliard – in 1915 - he shared the Loeb Memorial Prize with Sascha Jacobsen. He was 19 years old. Afterward, as part of the Loeb Prize awarded him, he made his debut in Carnegie Hall and was very well received. In February or March of 1917, he received (on loan) a Stradivarius violin (the 1703 Rougemont Strad) and a Tourte bow from a benefactor – Edward Schafer – which he used for about ten years. In 1929, for understandable reasons, the violin was returned to the benefactor to help him with payment of debts after the stock market crash. The Rougemont was later played for two years by Jacques Gordon, concertmaster of the Chicago Symphony. I do not know where it is now. Breeskin joined the New York Symphony in 1917. At that time, this orchestra was being conducted by Walter Damrosch. Though it was organized many years after the New York Philharmonic, it was the first American orchestra to tour Europe - it merged with the Philharmonic in 1928. Among the New York Symphony’s members were Mischa Elman and Pablo Casals. In early February, 1917, Breeskin appeared in recital at the Aeolian Hall in New York City. A little over a year later (February 28, 1918), he played there again. One of the works he played at this second recital was Bruch’s second concerto with Lawrence Goodman at the piano. On April 1, 1919, he finally made his Carnegie Hall debut, a debut which for unknown reasons, had been postponed several times. Among the works he played was Lalo’s Symphonie Espagnol. This time, he was accompanied by pianist Josef Adler. He was very favorably received at each of his recitals. In June of 1920, he married into a very wealthy American family. Anyone else would have used these newly-acquired resources to become a very major and influential figure in music, but not Breeskin. He was about 24 years old. At about the same time, it became known that he was a serious gambler. Around this time, he also became concertmaster of the Capitol Theatre Orchestra in New York. He was named conductor of the Minneapolis Symphony in 1925. Because of his gambling habit and the consequent accumulation of gambling debts, that job did not last long. Having left Minneapolis within the year, he went to Pittsburgh where he helped re-organize the Pittsburgh Symphony. There, he was concertmaster and associate conductor. The gambling continued. His last year in Pittsburgh (1929-1930), he was named Principal Conductor. He left Pittsburgh after his divorce from his wealthy wife. I am guessing that up to this time, his wife’s family may have been taking care of his huge gambling debts. Then, he returned to New York. He worked as an orchestral musician and arranger for a few years. He did some recording as conductor of a pickup orchestra for the KBS (Keystone Broadcasting System) label. Those recordings may still be available though they mostly feature light classical or salon music. He also recorded several violin pieces with pianist Theodore Saidenberg for KBS, one of which can be found on YouTube. Breeskin may have also recorded for the RCA and Brunswick labels. Many years later (1937), he found himself in Hollywood. There, he wrote and arranged music and he helped form the Hollywood Bowl Symphony. Nevertheless, having at one point in 1940 stolen the orchestra’s payroll, he exited to Mexico City, where he worked as musical director for radio stations XEW, XEX, and XEB, gave lessons, and composed movie soundtracks. His second family later joined him. If it’s true that he studied languages at Columbia, those studies now came in handy. One source has it that he lived like a king, surrounded by servants. As far as I know, he never set foot in the U.S. again. In any case, his great success in Mexico lasted about five years. The gambling had continued and he was finally imprisoned for supposedly being on the wrong side of the political agenda – he may have been a Communist - and, presumably, for his gambling debts as well. He was pardoned in 1958. He was 62 years old. While in prison, he wrote a piece entitled the City of the Dead. It got good reviews when he premiered it later on. Whether it is still performed is anyone’s guess – I’m guessing it is not. He married for a third and final time after leaving prison. Breeskin died May 9, 1969, at about age 73. He left three wives (Adelyn, Anna, and Lena) and seven children. Breeskin's major legacy is probably daughter Olga Breeskin, well-known dancer, singer, and violinist.